2018 SCHOOL OF BIRDING Workshops - Here they are!!! There are few places in the world that can equal or surpass the birding phenomenon at Cape May. 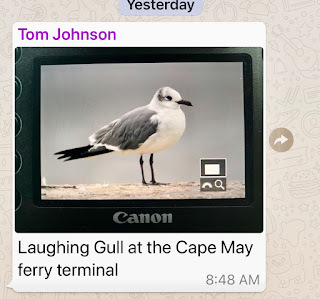 Likewise, our Cape May School of Birding is unequaled for its range of content and quality of leaders - providing a fun, interactive, and personal setting to learn about birds and nature!!!!! Our full 2018 schedule of in-depth workshop is now set, and we have brought back many of the favorites and added some exciting new programs. These one-three day events are led by experts in their field: world-class birders and naturalists that have often written the guides we all rely on. Our intimate approach to enjoyment and teaching will provide the opportunity and information you need to grow in understanding and appreciation. While the majority of time is spent in the field watching birds and nature, some of the workshops will incorporate an indoor session – a chance to demonstrate and discuss identification, techniques, conservation, and ecology. Along the way, you’ll meet like-minded people and are sure to form lasting memories and friendships. From beginner to advanced, all are welcome! 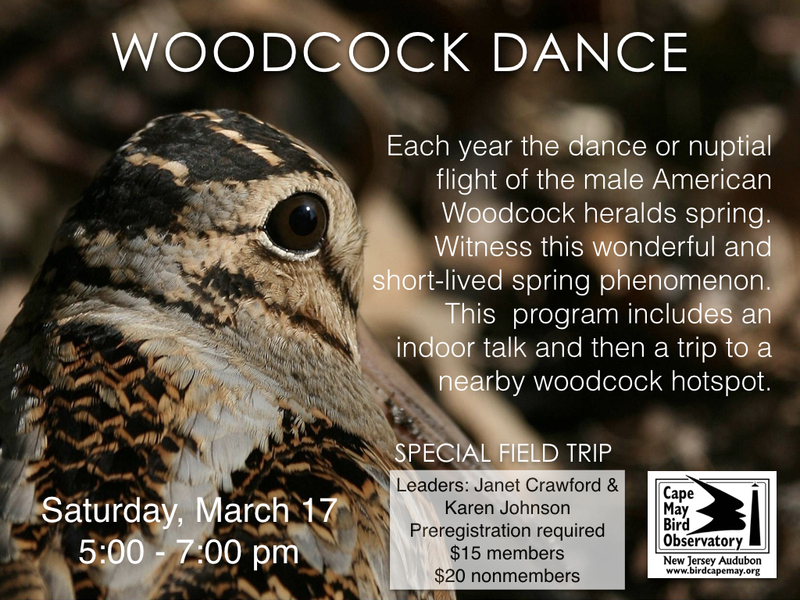 All the while, your registration fees are helping support the mission of New Jersey Audubon’s Cape May Bird Observatory. 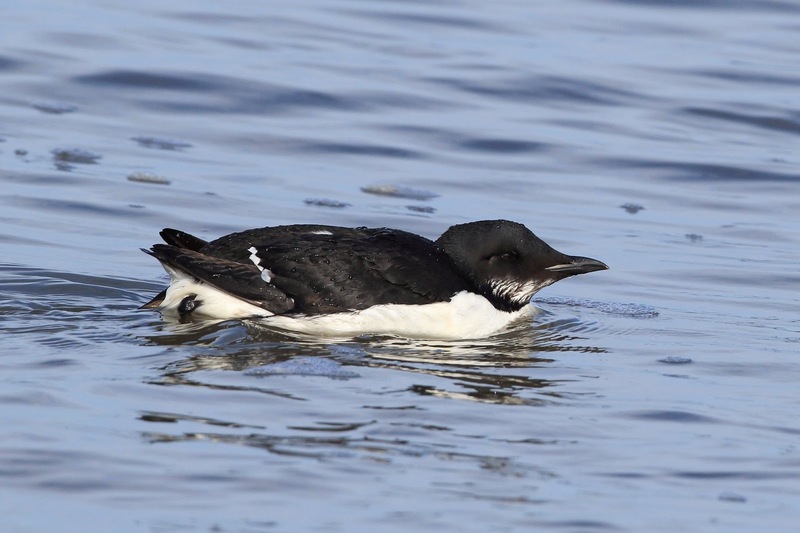 Several new additions are coming up soon in April - Predictive Birding 101 with Tom Reed (April 14), Birding With A Purpose with Tom Johnson (April 22), and Visible Migration/Birds in Flight with Tom Reed (April 28) - touching on where/when to bird, documentation and eBird, and the magic of bird migration. "Hi, my name is Rebecca Perruci and I am so excited to become a part of the New Jersey Audubon community this year! I have always been fascinated with the animal kingdom and enjoy being out in nature. I pursued these interests with a degree in Zoo and Wildlife Biology from Malone University in Canton, Ohio. Being surrounded by wonderful teachers, mentors, and friends, I couldn’t help but be encouraged in my love for birds and birding. After graduating in 2016, I decided to channel my desire to help birds into the field of zoo-keeping. I have been working as a bird keeper at the Gulf Breeze Zoo in Gulf Breeze, Florida, for almost two years. My time at the zoo has helped me discover that what I love most of all, though, is teaching people about animals and the natural world around them. It is my goal to share my love of birds through public education, so as to inspire the next generation of biologists and conservationists. When I’m not out birding—which, admittedly, is most of the time—I can be found trail running, painting and drawing, and spending time with my Yellow-naped Amazon Parrot." With temperatures slowly climbing and the days getting longer, spring raptor migration is underway. For the 36th consecutive year, a Spring Hawkwatch is being conducted at the Mills Reservation on Edgecliff Rd. in Montclair, NJ - every day until May 15 (9:00 am - 5:00 pm). David hails from Montoursville, PA. He is on the board of directors of the Lycoming Audubon Society. His local hawkwatch is the Route 15 Overlook. Last fall he was the counter at the Ashland Hawkwatch in Delaware. David has a degree in mathematics from Lycoming College. Outside of birding, he enjoys photography and playing guitar. He is already counting and totaled 16 raptors on his first day (March 16th), including Turkey Vultures, Cooper's Hawks, Sharp-shinned Hawks, and a Red-shouldered Hawk. You'll be able to follow along as we live stream the count on our website - Live Data through Trektellen (check back if it's not up and running yet), or check the whole season at Trektellen.org under Montclair - Hawkwatch. Better yet, please stop by and make him feel welcome and share in the joy of hawkwatching!!! 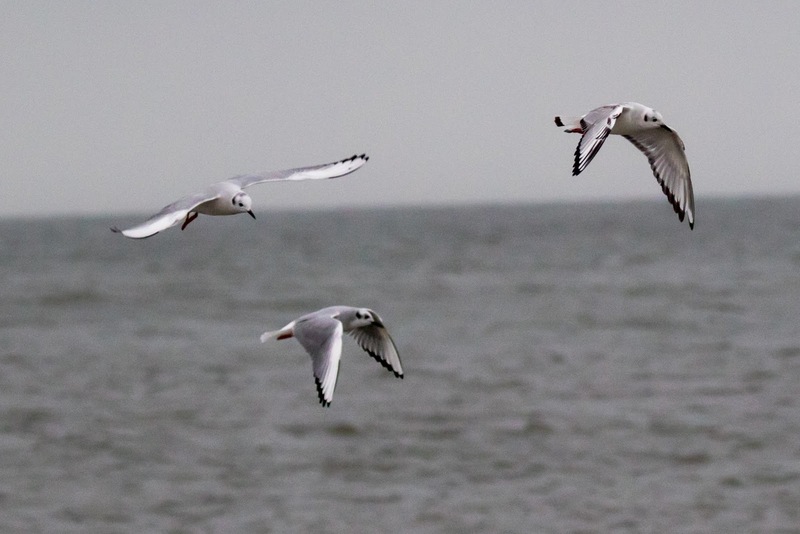 From the brown and mottled to the clean and gray, you either love gulls or you don't. Whatever camp you're in, join Michael O'Brien on this School of Birding workshop for a morning in the field, learning the easy way to separate the common wintering gulls from the less common and even rare, such as a Iceland Gull. You'll also learn to cut through the fancy terminology around age and molt. 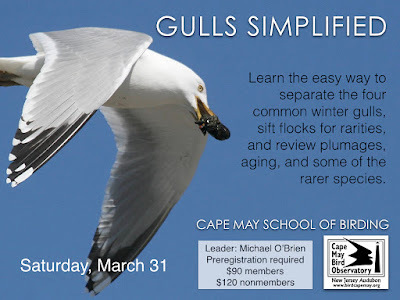 After lunch, you'll head indoors for a review of gull plumages, aging, and rare species. 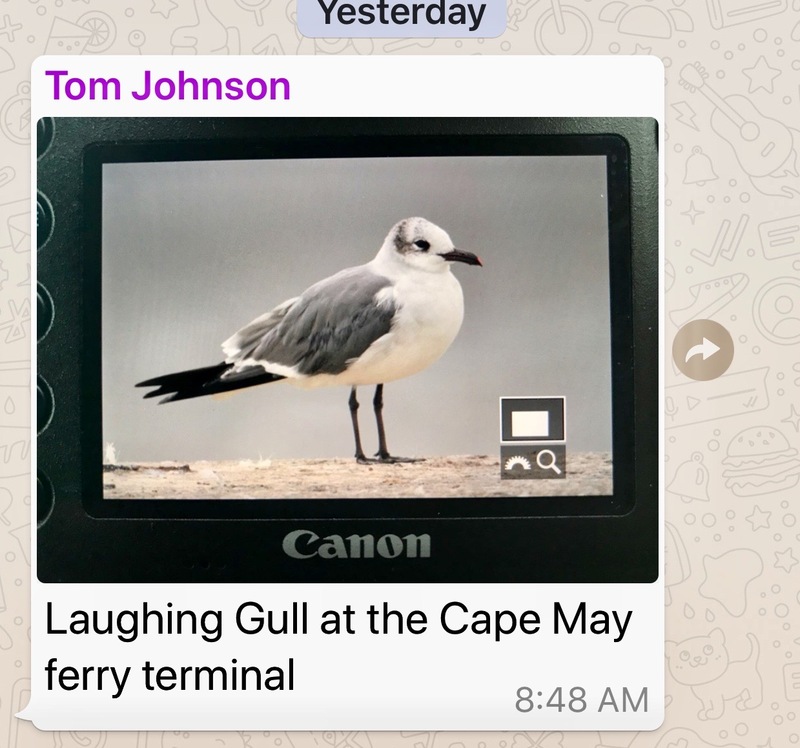 By the end, you're sure to love gulls, too. Preregistration required. 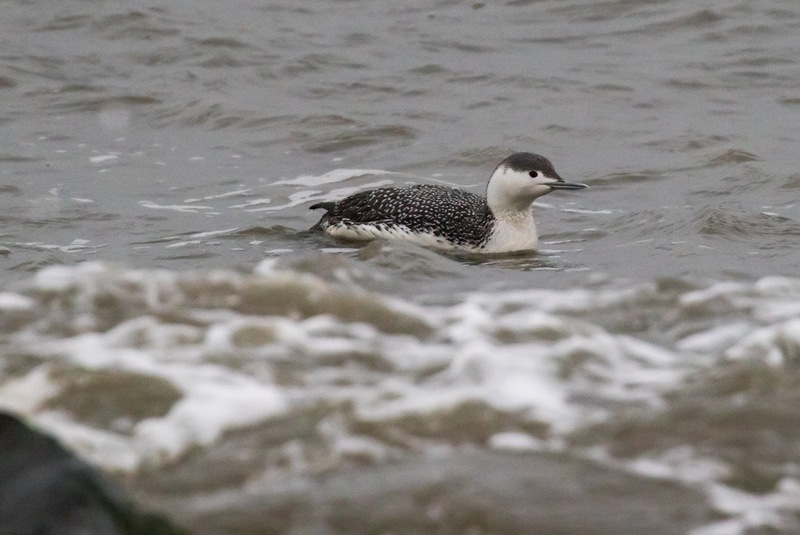 March 1st was the kickoff for the newest migration count in Cape May, dubbed "Springwatch". This all-volunteer count has been going on for a few years but over the last three has become more regularly carried out on a daily basis between March and June. Last year New Jersey Audubon's Cape May Bird Observatory was able to house several volunteer counters for the Springwatch, and this year we've gone a step further and offered some administrative support in addition to housing, for facilitating those who are willing to come and put in a few days to a few weeks of counting. 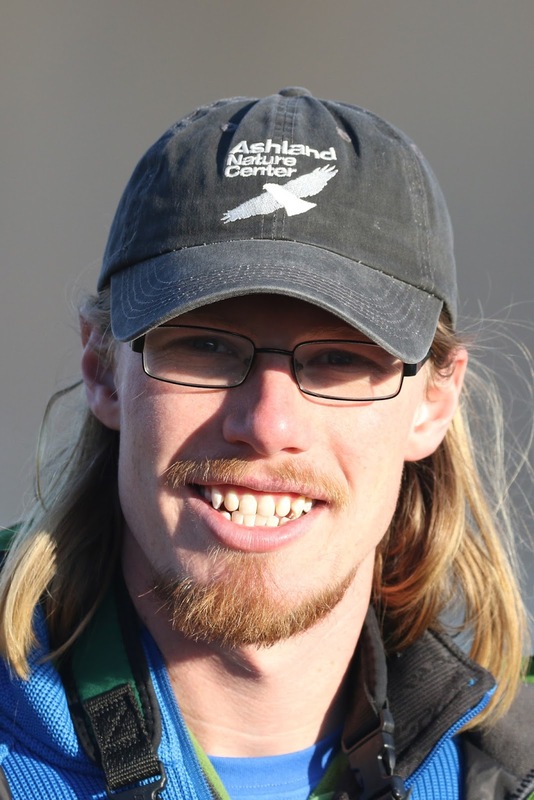 The count continues to be led by Tom Reed, Cape May Co. native and author of the birding year in review for our annual journal, the Peregrine Observer. 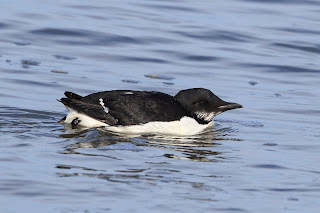 Tom has been splitting his time between Cape May and Duluth, MN, and has recently returned to carry out the spring count. You can track the movement of birds each day on the Trektellen.org site (today's count is here: http://www.trektellen.org/count/view/1703/20180307?sa=1), or just show up to the Coral Avenue dune crossover any day between now and the end of May. The count begins at sunrise and continues for a minimum of 3 hours. The count may continue longer if the flight warrants it, and on rainy days the count is moved to the sheltered side of the Sunset Grille at the west end of Sunset Boulevard. I had the pleasure of being the counter last Saturday morning and really enjoyed the diversity of birds that graced my view over the three hours, despite the overall low volume (winds howling out of the NW are not conducive to large flights in spring!). 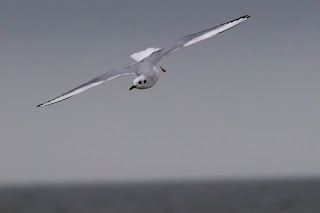 I especially enjoy watching the Bonaparte's Gulls (Chroicocephalus philadelphia ; Ord 1815) and their distinct flutter-flight, so buoyant in the air, and distinctly marked with a bright white wedge on the leading edge of their wing. I didn't have a chance to photograph birds while I was counting, so I headed out to Sunset Beach this morning to see if I could grab a few shots. 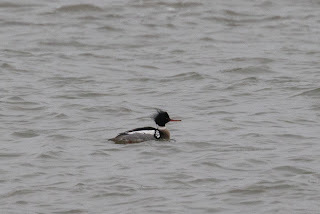 The conditions were less than favorable (cloudy and rainy) but the birds were close to shore and putting on a show as they fed in the tumultuous whitewater. 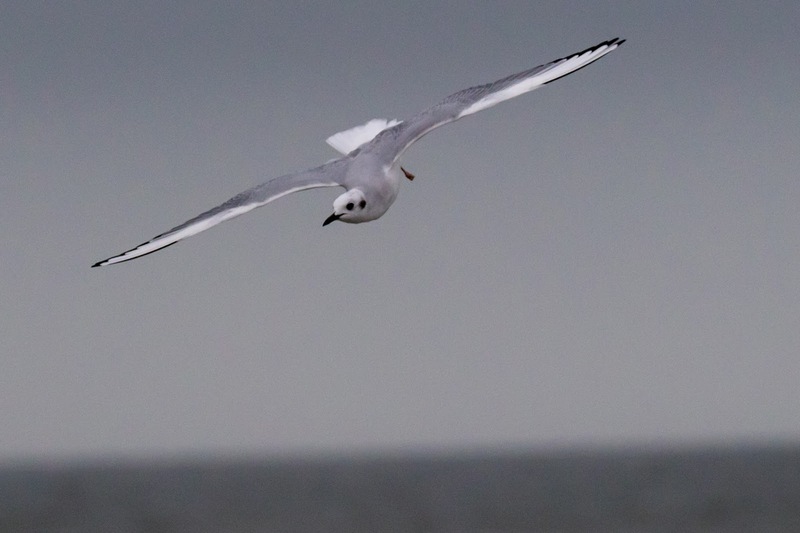 Bonaparte's Gull with headlights on and coming in hot! Bonaparte's are a "two-year gull" meaning it takes two years for them to reach adult plumage. At this time of year all Bonaparte's are in winter plumage, sporting a white head with dark ear spot and black bill. Legs are bubblegum pink and obvious when the birds are standing on the beach. Birds born last summer have bold dark markings on the upper sides of their wings, as well as the tip of their tail, making them easily recognizable as "1st winter" birds (this is their first winter since they were born). Adult birds, in contrast, show clean gray backs and all-white tails. Unique among gulls, Bonaparte's Gull nest almost exclusively in trees within the remote taiga and boreal forests of Canada and Alaska. 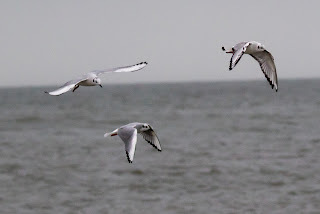 Lucky for us, in winter they can be quite social and indifferent to humans, providing great opportunities to view them near shore especially along the Delaware Bay! Of course as we progress into spring we will see diversity begin to ramp up quite quickly, so if you'd like to check out some of the great birds Cape May has to offer be sure to join us on one of our guided walks, attend one of our School of Birding workshops, or get a personal tour with our guide-for-hire service. Or free to pick up at our Northwood Center, 701 E. Lake Drive. We hope to see you soon here in Cape May! 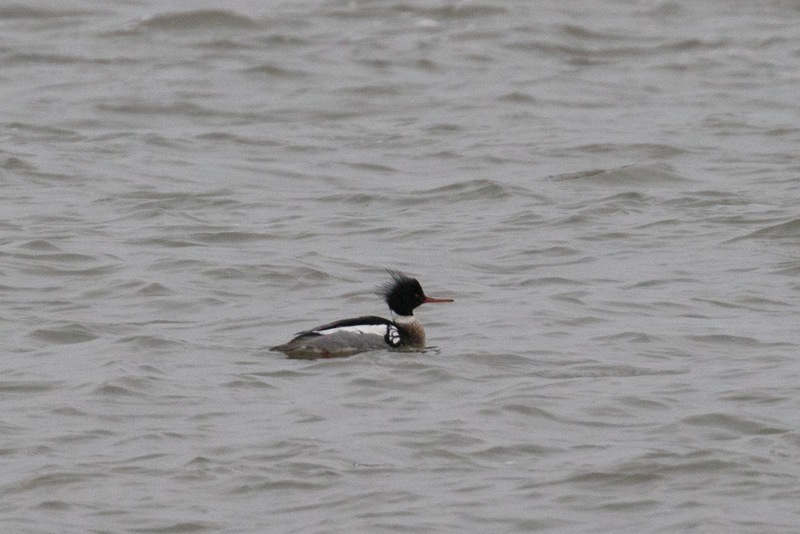 Red-breasted Merganser, the punk rock duck! Each year the dance or nuptial flight of the male American Woodcock heralds spring. Witness this wonderful and short-lived spring phenomenon. 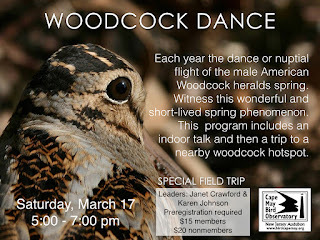 Join Associate Naturalists Janet Crawford and Karen Johnson at the Center for Research and Education for a brief indoor session, then travel to a nearby woodcock hotspot to experience it yourself. Preregistration required. March 1 was also the kickoff of the volunteer-based visible migration count dubbed “Springwatch” which takes place daily from the Coral Avenue Dune Crossover on Cape May Point starting at sunrise and continuing for at least 3 hours depending on flight volume. Come visit our volunteer counters at your leisure, or contact Program Director Brett Ewald (brett.ewald AT njaudubon.org) to inquire about becoming a volunteer counter. You can also follow along on http://www.trektellen.org to see what's being spotted each morning. We're in the transition between winter and spring, when gregarious blackbird flocks continually descend on the feeders at the Northwood Center and the trees are full of metallic calls, guttural gurgles, and a variety of whistles. 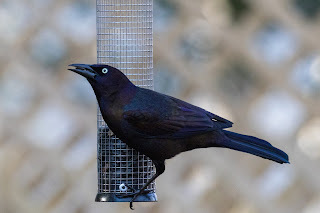 Common Grackles (Quiscalus quiscula) are one of the most common icterids in Cape May right now, along with Red-winged Blackbirds and a smaller number of Rusty Blackbirds. Common Grackles come in three "flavors": purple, bronze and the southeastern subspecies colloquially refereed to as the "Florida Grackle" despite breeding from North Carolina to Louisiana. 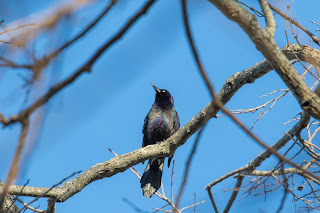 In Cape May we can get both the purple (Quiscalus quiscula stonei ; Chapman, 1935; Named for Dr. Witmer Stone, author of Bird Studies at Old Cape May - thanks to Scott McConnell for pointing this out!) and the bronze (Q. q. versicolor ; Vieillot, 1819) subspecies, as the bronze is most migratory and passes over the range of both the purple and "Florida" subspecies. Currently the flock behind Northwood has been dominated by the purple subspecies which breed south of Southeast New York, and east of the Appalachians down to Alabama and central Louisiana. Keep an eye out, though, as the bronze birds continue to pass through on their return migration and get mixed up in these big blackbird flocks over the next few weeks!